Murder on the Menu provides customized interactive murder mystery parties, events and other entertainment for meetings, conventions and special events, at your choice of venue. San Francisco Bay Area, California, U.S. and beyond. A Division of TeamBuilding Unlimited. With over 28 years of interactive mystery entertainment in the San Francisco Bay Area, California, and the U.S., Murder on the Menu adds suspense and intrigue to your special event. Murder on the Menu designs mystery plots for corporate meetings, incentive programs, appreciation dinners, FAM trips, hotel openings, fundraisers, conventions and more. Murder on the Menu creates customized murder mystery events that complement the occupations and interests of your guests. Our talented actors and support staff involve you and your guests directly in the mystery action by cleverly interweaving the agenda of your meeting, the jargon of your industry, and specific people from your group into the script. Your group's raison d'être is reinforced with the added excitement and vitality of interactive theatre! Murder on the Menu works with you to create an event that not only "hooks" you with a story and characters that are unbelievably close to home, but lets you wrestle with the clues in an unforgettable whodunit. 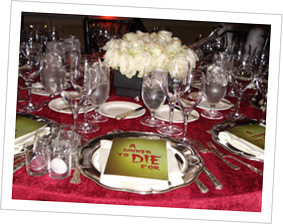 A customized murder mystery insures a successful and memorable event. Janet Rudolph and Frank Price and our professional actors and staff will lead you through the Crime of Your Life! Murder on the Menu creates many types of interactive corporate theatre, theme parties and special party personalities, as well as TeamBuilding Activities. Murder on the Menu will perform mystery parties at the location and venue of your choice delivering on-site events for groups of 5 to 500! Contact Us to Create Your Next Customized Mystery Party or Interactive Entertainment. Murder on the Menu will perform at the location of your choice. Groups from 5 to 300! All Content © Murder on the Menu. Web site by interbridge. Banner by Golden Sage Creative.